The Collegio del Cambio (guild of moneychangers) was the second most important guild of Perugia (after the Collegio della Mercanzia). The rich members of these guilds belonged to a class known as the “popolo grasso”: this distinguishes them from the “popolo minuto”, who generally belonged to the tradesmen’s guilds. The appearance of the office of Capitano del Popolo in Perugia in 1255 was probably as a result of a resurgence in influence of the guilds representing the “popolo grasso”. The Collegio della Mercanzia was initially in the lead, but the Collegio del Cambio also came to the fore in the subsequent period. It was first documented in 1259, when it was given responsibility for safeguarding the precious metals that were to be used in the new zecca (mint). In the following year, it was given responsibility jointly with the Collegio della Mercanzia for all provisions relating to the minting of money in the city. It soon acquired other responsibilities in the area of public finance and in the administration of justice in financial disputes. The Collegio della Mercanzia provided four of the five “consuls of the arts” who supported the Capitano del Popolo in the government of Perugia from 1266. However, this representation was reduced to two in the 1280s, allowing the Collegio del Cambio to provide the third consul and the other guilds (representing the “popolo minuto”) to provide a further two on a rotating basis. The guilds as a whole increased their power at the expense of the nobles, and in effect assumed the government of the city in 1295. The Collegio del Cambio controlled the city’s goldsmiths until 1296, when they were given the right to form their own guild. However, the Collegio di Cambio remained in control of the trade in precious metals in the city. ✴the Collegio del Cambio usually provided one member, an arrangement that became permanent in 1385. ✴the Collegio di Cambio acquired the Ospedale di San Giacomo, a hospice for pilgrims near Porta San Pietro in ca. 1400. At the same time, it acquired what had been the small parish church of San Giacomo, which had belonged to the Abbazia di San Pietro, to serve as its chapel (the Cappella di San Giacomo). Members of the nobility (who had been included in the Libro Rosso of 1330) were prohibited from guild membership. However, Braccio Fortebracci overturned this provision when he assumed control of Perugia in 1414. Nobles subsequently came to dominate the college, and non-nobles were explicitly prohibited from membership in 1670. According to the oldest statutes of the Collegio del Cambio, which date to 1326, it held its meetings in the church of Santa Maria del Mercato (later Santa Maria del Popolo). However, by 1361 it had its own building near the Duomo, on the site now occupied by Palazzo Conestabile della Staffa. When the Collegio della Mercanzia acquired premises in Palazzo dei Priori in ca. 1390, it was perhaps inevitable that the Collegio del Cambio would eventually emulate it. So it was that the Priors petitioned Pope Martin V in 1428 to allow the Collegio del Cambio to buy properties for its new headquarters. Palazzo dei Priori was extended in 1429-43 along in what is now Corso Cavour, and engulfed the church of San Giovanni del Mercato, which belonged to the monastery of San Paolo di Valdiponte. The properties required for the Collegio del Cambio, which also belonged to the monastery, extended from this point as far as Via Boncambi. Negotiations were protracted, but Pope Eugenius IV finally ruled in favour of the Collegio del Cambio in 1441, and demanded that Abbot Angelo Felice maintain perpetual silence on the matter. This did not stop him from continuing to demand compensation throughout the remainder of his tenure, which ended in 1445. In 1452, the college embarked on the construction of new premises on the cleared site. The work was mostly commissioned from Bartolomeo di Mattiolo and Ludovico d’ Antonibo. Payment was made for the main portal in 1456, and the first document signed in the new headquarters at the start of the following year. The fourth storey forms part of Palazzo dei Priori, which was extended over the Collegio del Cambio at an unknown date after 1473. (The new space now accommodates Rooms 5 and 6 of the Galleria Nazionale). ✴The main portal (1456) leads to the Sala dell' Udienza. ✴The smaller portal to the left, which leads to the Sala d’ Ingressa (below), has the arms of the guild, a griffin on a money chest (illustrated here), to the right of it. ✴A matching portal to the right replaced the original entrance to San Giovanni del Mercato. Traces of the original entrance arch can be seen above it. The new portal led to the Cappella di San Giovanni Battista, and the inscription on its lintel records this dedication to St John the Baptist. The arms of the Collegio del Cambio can also be seen above the middle window on the third storey. The upper storeys were remodelled in the 16th century. The Collegio del Cambio transferred a room the Sala d’ Ingressa to the Collegio dei Legisti (lawyers’ guild) in 1613, at which point it became known as the Sala dei Legisti. 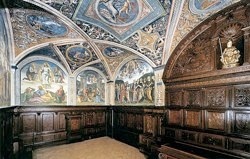 The Collegio dei Legisti commissioned the wooden paneling of this room in 1615-21. 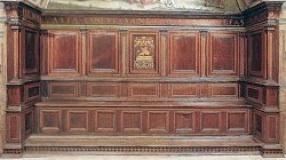 The wooden panelling (1490-93) in the Sala dell’ Udienza (Audience Chamber) is by Domenico del Tasso and his sons, Francesco and Marco. Antonio Bencivenni da Mercatello signed the wooden imposts on the interior side of the door in 1501 and was paid for the work in the following year. 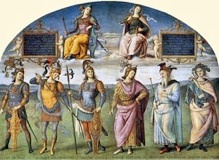 The extensive fresco cycle in the Sala dell’ Udienza is the masterpiece of Perugino. According to Giorgio Vasari, his main assistant was Andrea d’ Assisi, l' Ingegno. 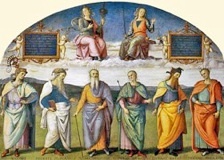 A frescoed self-portrait of Perugino appears as a panel hung from the left wall. The inscription by Francesco Maturanzio praises the artist: "If the art of painting was lost, he rediscovered it. If it was not yet invented, he brought it to this point". Pope Paschal II granted the ancient church of San Giovanni del Mercato to the Benedictine Abbazia di San Paolo di Valdiponte in 1110. It was documented as a parish church in 1285. It remained in the ownership of the abbey even after 1443, when it was incorporated into the fabric of the Palazzo dei Priori. Fra Wintherius (Winterio), who brought Sant' Anello (the Virgin's wedding ring) to Perugia in 1473, acted as rector of San Giovanni del Mercato until his death in 1506. As noted above, the Collegio del Cambio bought the church in 1506 and it was adapted to its current purpose over the following three years. The stone altar from the original church survives in situ. The Collegio di Cambio commissioned this altar frontal for it from Mariano de Ser Austerio in order to cover the ancient altar in the chapel. It depicts St John the Baptist in a tondo, a figure taken from a model by Perugino. The Lombard Gasperino di Pietro was commissioned to renovate the old church of San Giovanni del Mercato and adapt it for use as a chapel. He was paid for this work in 1509. 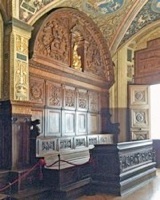 The main door (1508) of the chapel is attributed to Antonio Bencivenni da Mercatello, who had signed the corresponding door into the Sala dell’ Udienza seven years before (see above). In 1516, Antonio Benicivenni was commissioned to paint the frame for the altarpiece (see below). Giannicola di Paolo was responsible for most of the painted decoration of the chapel. ✴the frescoes (1511-5) in the vaults, which depict God the Father with the Evangelists, the Apostles, the patron saints of Perugia and the Doctors of the Church. ✴the altarpiece of the Baptism of Christ, with smaller panels of the figures of the Annunciation to the sides.